(CNN) -- Nobel Peace Prize laureate Aung San Suu Kyi is to be taken to a prison courtroom in Myanmar Thursday after an American was arrested for allegedly sneaking into the home where she is under house arrest, a spokesman for her political party said. A judge is expected to charge Suu Kyi and order her to be detained for two weeks, according to a written statement from the U.S. Campaign for Burma. The group said Suu Kyi was given a police summons to appear in court at Insein Prison in Yangon. She is to be charged under the government's State Protection Act and could face three-to-five years in prison if convicted, the group said, although it was not clear exactly what alleged offenses were to be cited. "This is the cunning plan of the regime to put Daw Aung San Suu Kyi in continuous detention beyond the six years allowed by the law they used to justify the detention of her," group spokesman Aung Din said in a written statement. "This also shows total defiance to the United Nations and the international community, who have been consistently and repeatedly calling for the regime to release all political prisoners, including Daw Aung San Suu Kyi." "Daw" is an honorific title. Suu Kyi, 63, was first detained in 1989 after mass protests against the military government and has been under house arrest for 13 of the past 19 years. She won the Nobel Peace Prize in 1991. She is rarely allowed visitors, except her doctor. Police block the entrance to her lakeside home in Yangon. And swimming in the lake is forbidden. The military junta that controls the nation ordered its name be changed from Burma to Myanmar and the capitol city's name changed from Rangoon to Yangon several years ago. Official Myanmar media say American John William Yeattaw swam across Inya Lake on May 3 and snuck into Suu Kyi's tightly guarded residence. According to the campaign statement, Yeattaw had entered Suu Kyi's house once before in 2008. It said she refused to meet with him last year and spoke to him this time only long enough to tell him to leave. A newspaper affiliated with the country's military junta said the American was arrested while swimming back from the house. But the newspaper account did not mention whether the man had encountered Suu Kyi. The spokesman for Suu Kyi's political party, Nyan Win, said she has done nothing wrong and that Yeattaw's appearance confirms security concerns she has voiced to the government. "This is a political issue, not a criminal issue," he told CNN. "She has done nothing wrong." Media accounts of the incident said the man confessed that he was visiting Yangon on a tourist visa and was staying at a hotel when he swam across the lake with a 5-liter water bottle, presumably to use as a float. Authorities found an American passport, a black backpack, a flashlight, a pair of folding pliers, a camera and money on him, the newspaper said. 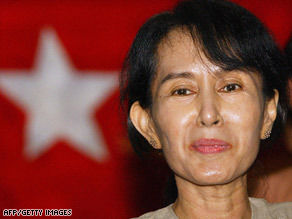 Suu Kyi was ordered to appear in court at 7:30 a.m. (9 p.m. Wednesday ET), according to the group. CNN's Kocha Olarn in Bangkok contributed to this report.